How often are you so moved by your job that you actually shed tears? On “Cosmos: A SpaceTime Odyssey,” this was a fairly regular occurrence. It is impossible to work on something of such scale and import without being overcome, now and again, in the exact same way you hope your audience will be. I will never forget the first day that Ann Druyan, Carl Sagan’s widow and the writer and executive producer of both series, first arrived in Los Angeles from her home in Ithaca, New York. Ann has a bearing and poise all her own, at once professorial and maternal. While the production office would eventually be transformed into a well-oiled machine – a sort of anthill of organized chaos that is representative of all Hollywood productions – it was then little more than a skeleton crew, assembled to prime the proverbial creative pumps. We gathered – the director, writers, producers and staff – in a room plastered from floor to ceiling with inspirational imagery, research photographs and concept art. As we took our places around the table, and I prepared to read the first episode aloud, Ann, in a tone that is both nurturing and instructive, told us stories about her life with Carl, the experiences they’d had making the first show, and how she wanted to honor his enduring legacy with this new work. “Carl would be so, so proud of each of you,” she said, “and what we are all about to undertake here.” Suddenly the room became blurry and I realized I had tears in my eyes. This was not just another television show that will air and be just as quickly forgotten. It was clear, even in the very beginning, that we were participating in something incredibly special and unique, a work of exquisite narrative power and profound human insight, a piece of entertainment that literally has the power to change the way people see themselves and their place in the universe. 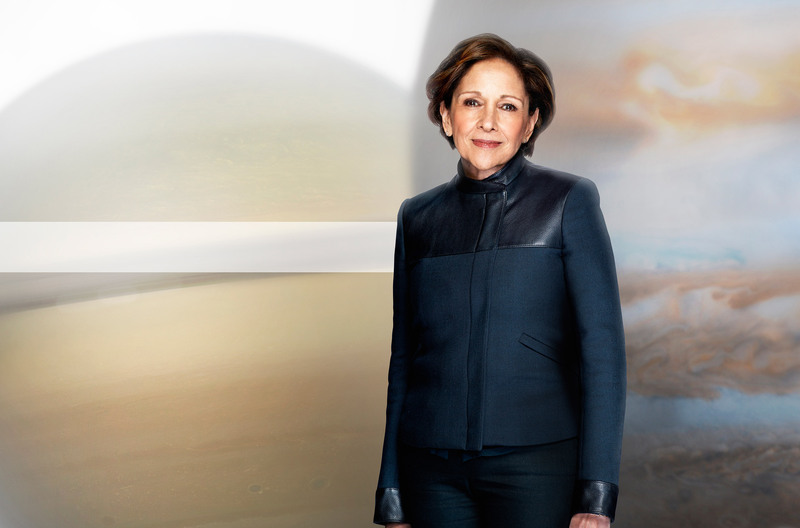 No one on this planet was closer to Carl Sagan than Ann Druyan. Her intimacy has preserved his spirit with a fierce passion and uncompromising resolve, and she poured that essence into this new work. She was the keeper of Carl’s flame, and it was the plumb line that guided everything we did. One of my favorite memories was of being present in the screening room when a rough cut of a scene was shown describing how a then young Neil deGrasse Tyson first met the famous Cornell astronomer. It was a beautiful and ephemeral moment, and in the dark of the theater, I saw Ann reach across to tightly squeeze the hand of our director, Brannon Braga, before wiping tears from her eyes. We’d gotten it right. Ann worked doggedly and tirelessly, overseeing nearly every aspect of the production. Hers was the sort of unbending tenacity that came both from inexperience – recall that the first “Cosmos” was made more than three decades ago and for PBS, not a behemoth like FOX – and an absolute and uncompromising vision for every detail of the far distant finish line. And yet, despite this resolve, Ann still managed to produce a work that can stand entirely on its own, unmistakably an offspring of the original series, but with a tone, energy and voice all its own.